Every business likes to increase their sale and advertisement has direct impact on sales. How you present your product is a deal maker or deal breaker. 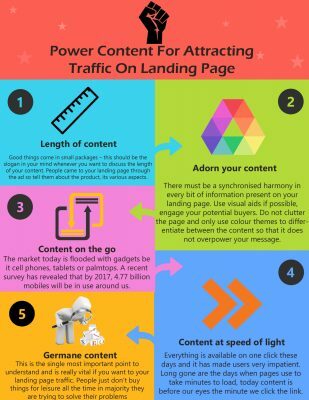 So when it comes to digital marketing – power content is required to attract traffic on landing page. Good things come in small packages – this should be the slogan in your mind whenever you want to discuss the length of your content. People came to your landing page through the ad so tell them about the product, its various aspects. They are not there to read a story (unless you are promoting a book). Do not put up large chunks of irrelevant information or gaudy images. In such scenarios chances are higher that readers may not read the whole content. Always filter the information by keeping in mind what is preferred by users because the aim is to convert potential buyers into actual buyers. Let’s consider a real life example: There are two parks in your locality- Park A and Park B. Park A is not well maintained-dry patches of grass, no flowers, dying trees, mud pond etc. Now Park b on other hand is well maintained- lush green grass, blooming flowers, happy healthy trees and let’s not forget, ducks in the pond. Let me ask you where you would like to go for a stroll. Surprisingly everyone will say park B because it has a serene feeling to it. Similarly content on your landing page should be well organised. There must be a synchronised harmony in every bit of information present on your landing page. Use visual aids if possible, engage your potential buyers. Do not clutter the page and only use colour themes to differentiate between the content so that it does not overpower your message. The market today is flooded with gadgets be it cell phones, tablets or palmtops. A recent survey has revealed that by 2017, 4.77 billion mobiles will be in use around us. These devices are going to overpower traditional desktops in the coming years. It is only logical to assume (seo) that in coming years users will prefer their content ‘on the go’. So make sure to create android versions so that you do not miss out on the opportunity to attract users from all domains of internet. Everything is available on one click these days and it has made users very impatient. Long gone are the days when pages use to take minutes to load, today content is before our eyes the minute we click the link. Make sure to capitalise on it and always try to minimise the time of loading for landing page. Users can easily get distracted by the plethora of content around your ad, we suggest reducing HTTP requests and using CSS to minimise file size. Your landing page should get the reputation of fast and easy access so that users don’t hesitate if they have to refer to it again. 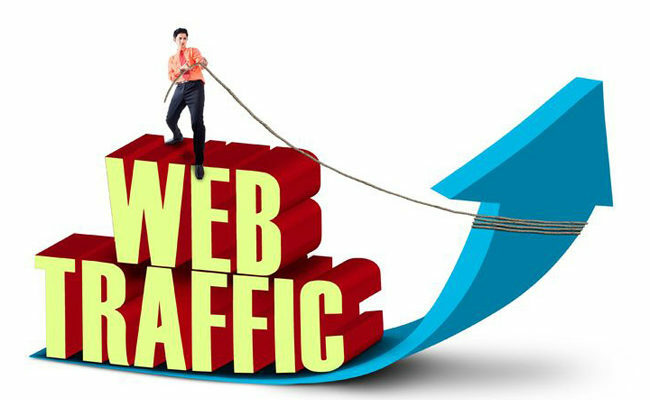 This is the single most important point to understand and is really vital if you want to your landing page traffic. People just don’t buy things for leisure all the time in majority they are trying to solve their problems. What we need here is to post relevant content, information that will help buyers to determine why your product is useful for them. We need to pursue them, tell them that they are looking at the single most useful product in the market. For this the primary point is to make your landing page and ad mirror image of each other. When a person clicks an ad- he is a potential buyer and our focus is to convert him to an actual buyer. Just because he clicked on your ad does not dictate he will buy. Explain the content in a clear and crisp way. Paint a picture for your client; narrate to him how his life will be changed by using your product. Lastly, try to remain concordant as much as possible. This means having same characteristics throughout your ad and landing page. Concordant content will add certain charisma to your brand i.e. your brand will be known for its value system. Further it will enhance your community support as you will adhere to same standards. All this will go a long way in promoting your business. Landing page creation is like creating a piece of art: it takes times you cannot get all the right colour and shades in one stroke.Patience is a must have virtue here. Combine your creativity with our power content techniques and you are sure to attract more than usual traffic on your landing page.